A fast, but more importantly consistent, run through all six races, never finishing lower than 4th place, saw series’ returnee, Graeme Smyth from Auckland, claim a popular round win. Teammate and multi-time former class title holder Ryan Grant, meanwhile, won two of the class races (the 4th Heat and the Final) but ended up fourth overall thanks to a dnf in the first heat. Finishing all six races, with a best result of 2nd and worst of 5th, saw defending class title holder Mat Kinsman finish 2nd overall for the second time in two rounds. 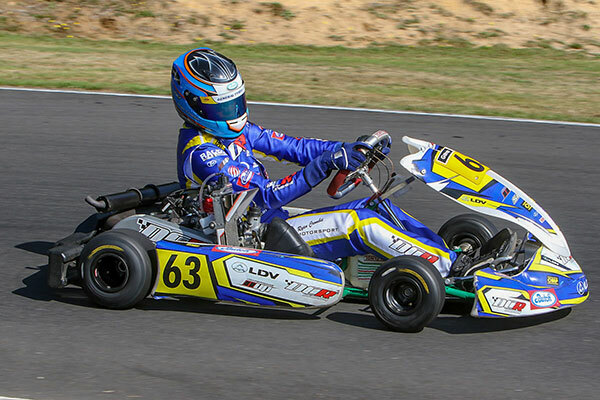 And Rnd 1 winner Daniel Bray managed to salvage the final spot on the Rnd 2 podium (3rd) and retain his overall series’ lead after topping the time sheets in the Top 10 Shootout and winning the first three Heats only to burn his kart’s clutch out at the start of the fourth. Bray came back from the Heat 4 dnf to win the Pre-Final, and shadow fellow Aucklander Ryan Grant home in the Final but with points from every race counting towards the round result (and no drops) 3rd place on the round podium was the best the Auckland-based international could salvage. Others were quick but ultimately unlucky, Bray’s own teammates, Dylan Drysdale and Matthew Payne, two (very good) cases in point. 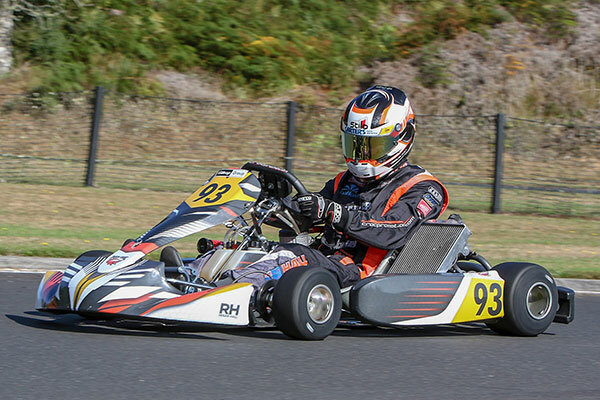 Payne, 16, from Auckland, was quickest in qualifying, slipped back to fifth in the Top 10 Shootout but came back to finish 2nd in the first Heat and and 4th in the third before also burning out his kart’s clutch at the start of the 4th. Like Bray he quickly made his way forward (from P10) to finish 5th in the Pre-Final only to suffer a second dnf in the Final thanks to a broken chain. 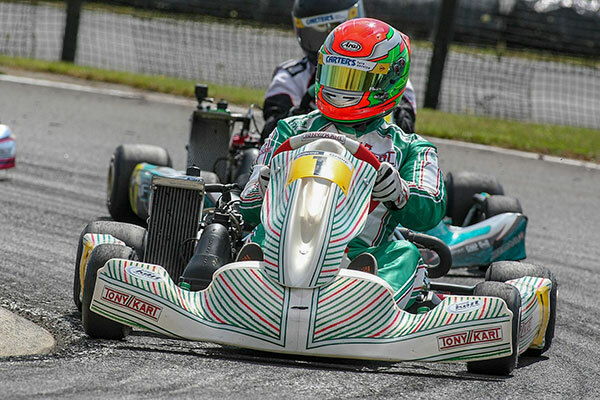 A dnf in the second Heat, plus a nose-cone penalty in the Pre-Final also put a damper on Dylan Drysdale’s weekend, though the pace and race-craft he showed in working his way from P14 to P6 in the Final is a better indicator of his form than the 10th place for the round his score earned. There were any number of other ‘what-ifs’ in a 26-strong field series promotor Steve Brown reckons now rivals any other similar ones around the world in terms of depth as well as pace up front. 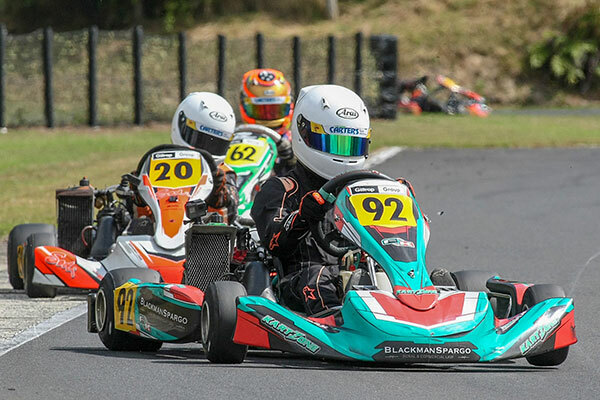 With so many Juniors now choosing to go the 6-speed/125cc KZ2 way the category is only going to get more competitive as well, as a quick scan through the Rotorua results is wont to prove. Fifth overall was 17-year-old Wellington international Ryan Wood, who set the 3rd quickest time in the Top 10 Shootout before going on to finish an event-best 3rd in the second Heat. 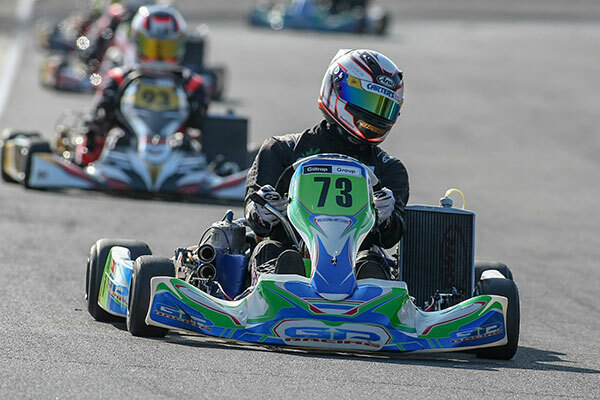 Fellow teen Jacob Cranston, 18, from Palmerston North finished sixth on his return to the KZ2 class after a season in a Toyota 86, two places ahead of 17-year-old Josh Parkinson (8th) and just three ahead of fellow Auckland 17-year-old Sam Wright. 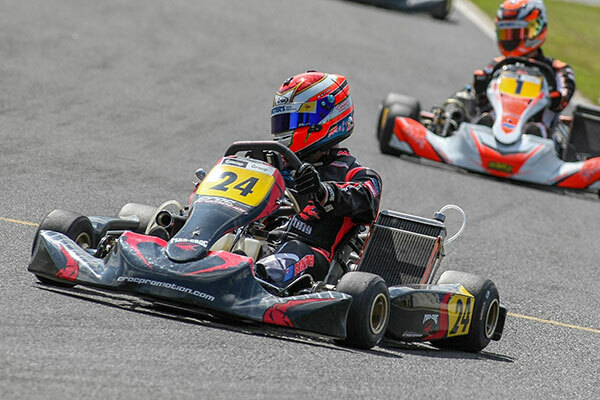 In the other KZ classes, Regan Hall from Auckland completed a second clean sweep of race wins in as many rounds in Aarque Group KZ4, leading home former champ Garry Cullum from Auckland and Aaron Wooley from Hamilton. Rnd 1 class winner Jared MacKenzie from Auckland also again topped the podium in Aarque Group KZ2 Masters, though this time it was from another Aucklander, Andrew Hunt, with Tim Loughran from the Hawke’s Bay again third. NZ Rotax Max Heavy class #1 Zach Zaloum, from the Hastings, made a victorious return, meanwhile, to the series at Rotorua after missing the opening round at Palmerston North, winning all but one of the Manawatu Toyota-backed 125cc Rotax Max Heavy class races to claim the round win from Tauranga ace Darren Walker, and Caleb Hartley from Hamilton. Former Junior class standout Ryan Crombie from Auckland made every post a winning one in the Giltrap Group-backed 125cc Rotax Max Light class, qualifying on pole and going on to win all four Heats as well as the Pre-Final and Final for an emphatic round win over fellow recent Junior class graduate Fynn Osborne from Hamilton, Ashton Grant from Auckland and Rnd 1 winner Michael McCulloch. Finally, local drivers Riley Spargo and Bradley Hewson ended up first and second respectively in Giltrap Group 125cc Rotax Max Junior. Fynn Osborne’s younger brother Clay claimed pole position in qualifying but Spargo went quicker to top the leader board in the Top 10 Shootout. Round – 1. Graeme Smyth; 2. Mat Kinsman; 3. Daniel Bray; 4. Ryan Grant; 5. Ryan Wood; 6. Jacob Cranston. Points after Rnd 2 of 6 – 1. Daniel Bray 178 points; 2. Mat Kinsman 177; 3. Graeme Smyth 175; 4. Ryan Grant 168; 5. Jacob Cranston 167 6. Rhys Tinney 165. Round – 1. Jared MacKenzie; 2. Andrew Hunt; 3. Tom Loughran; 4. David Malcolm; 5. Darren Aislabie; 6. Jason Gunn. Points after Rnd 2 of 6 – 1. Jared MacKenzie 184 points; 2. Andrew Hunt 173; 3. Tim Loughran 172; 4 Kevan Storr 170; 5. Jason Gunn 167; 6. David Malcolm 85. Round – 1. Regan Hall; 2. Garry Cullum; 3. Aaron Wooley; 4. Sam Dashfield; 5. Shaun Curran; 6. Luke Scantlebury. Points after Rnd 2 of 6 – 1. Regan Hall 184 points; 2. Garry Cullum 176; 3. Aaron Wooley 172; 4. Sam Dashfield 170; 5. Shaun Curran 167; 6. Gerhard Benadie 166. Round – 1. Ryan Crombie; 2. Fynn Osborne; 3. Ashton Grant; 4. Michael McCulloch; 5. Zane Hills; 6. George Sampson. Points after Rnd 2 of 6 – 1. Fynn Osborne 178 points; 2. Ryan Crombie 177; 3. Michael McCulloch 176; 4. Ashton Grant 170; 5. Marco Giltrap 164; 6. Shaun Johnston 160. Round – 1. Zach Zaloum; 2. Darren Walker; 3. Caleb Hartley; 4. Adam Bell; 5; Felix Hume; 6. Hayden Knight. Points after Rnd 2 of 6 – 1. Darren Walker 174 points; 2. Henry Gelb 167; 3. Simon van der Drift 163; 4. Craig Holmwood 161; 5. Zach Zaloum 92; 6. Ashley Higgins 91. Round – 1. Riley Spargo; 2. Bradley Hewson; 3=. Dylan Grant & Josh Richmond; 5. Breanna Morris; 6. Nathan Crang.